One-Year Anniversary Post… Versatile Blogger Award: Part Deux! First and foremost, I want to thank everyone who has been following “Sharkbait Writes” this past year and has taken the time to comment (I love reading your comments!). I am very excited to announce that TODAY is this site’s ONE-YEAR ANNIVERSARY! It’s hard to believe that it has already been a year since I started this site. I never imagined that I would have people visiting “Sharkbait Writes” from all over the world! That’s amazing! Thank you! And what better way to celebrate this day than announcing another nomination for the Versatile Blogger Award! I recently had the pleasure of receiving a nomination for this very cool award for a second time. This time Karen Einsel and Jordanna East were kind of enough to hand me this prestigious award. The “trophy” even looks different, so it’s almost like winning a different award! Yay! Anyway, you can read my post from the previous award HERE which gives you seven random facts about yours truly. Since I’ve been nominated again you get to read seven more random facts about me. I’ll try to keep this one short (Yeah, I know… good luck with that!). 1. I met “Grizzly Adams” when I was a kid. When I was about four or five years old Dan Haggerty (who played James “Grizzly” Adams in the TV show “The Life and Times of Grizzly Adams) had a meet and greet at the Texas Zoo in Victoria. He was the first and only actor that I have ever met, which I thought was really cool, particularly as a little kid. Mr. Haggerty signed autograph photos for me and my older sister and also took photos with us. My sister had a crush on “Grizzly Adams” and even got a kiss. She, of course, got all giddy about that fact. I have photos stored away somewhere (this was ages ago), but at the time of this blog post, I only have a stock photo of Dan Haggerty from IMDb. 2. I see dead people. I spent several years working as an obituaries coordinator at the local newspaper. After leaving the newspaper industry, I now focus on my writing and building my home-based business Jireh Administrative Services. About a month after leaving the newspaper, one of the funeral home owners contacted me and asked if I would be interested in working for him on a part-time basis at the funeral home. Since part of my business is offering various small business support services, we agreed on an “independent contract” (really, we just shook hands after agreeing on the details) and now I have a funeral home listed among my small business clientele. I basically help out in the office if needed, help out with visitations and rosaries, play “traffic cop” in the parking lot, and drive the hearse and limousine during funerals. On some occasions, I even help the funeral directors on “first calls”, which is basically bringing the deceased to the funeral home after he/she passes away. So, I literally see dead people. 3. 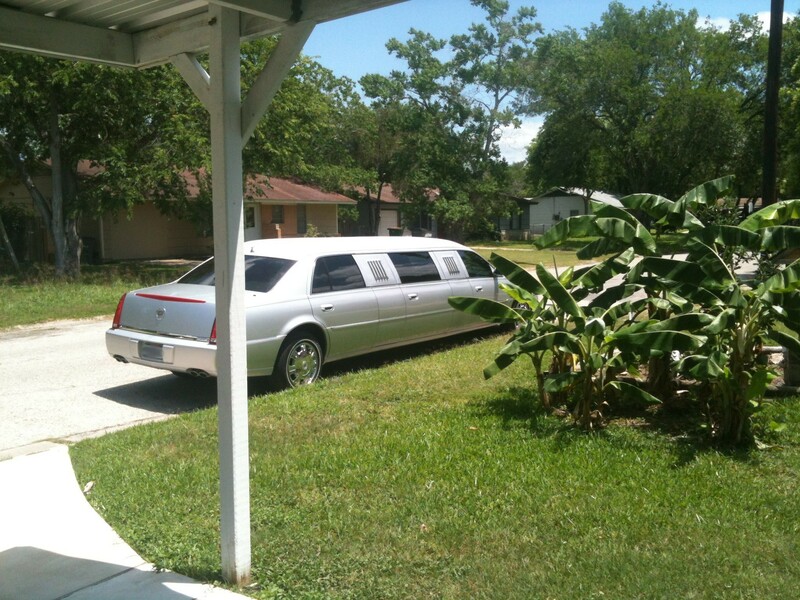 I drive a limousine on occasion. Just recently the owner of the funeral home that I help out at asked me if I would be interested in driving his limo on non-funeral related occasions. At the time he asked, I had only driven the limousine once during a funeral and still wasn’t very comfortable with it (that particular route we took didn’t have many turns). He gave me some pointers and told me that he really needed another person that he could call on to drive the limo and particularly needed one for that weekend. He told me the only way I was going to get comfortable with the limo was by driving it. He told me to take the limo for the day, drive it around town, practice the right turns, and take it home. He said it was free advertising for him anyway. He told me to keep it for as long as I wanted until I was comfortable with it. He encouraged me not to worry about it. Just take the car. I was a bit surprised, but how could I say no? Pardon me, sir, but have you any Grey Poupon? 5. I used to have an afro when I was a little kid. Thanks, Mom! Moving right along! 6. 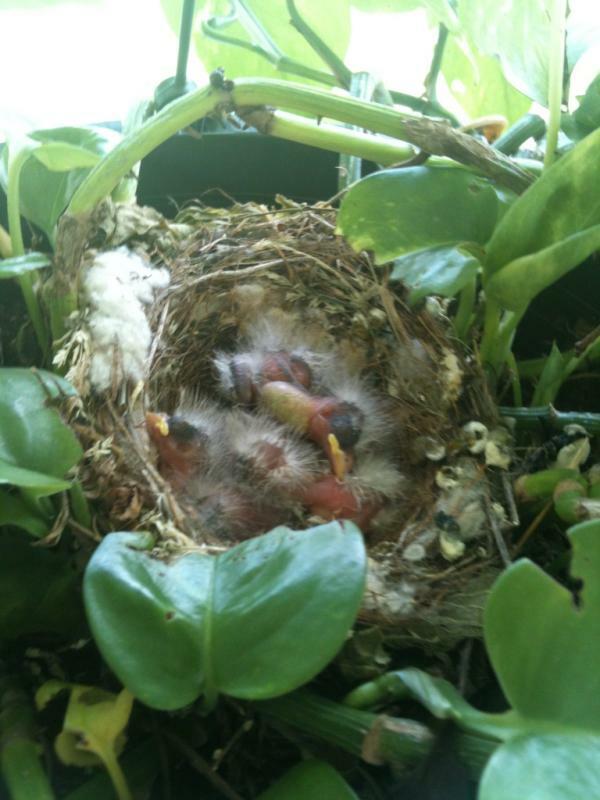 A family of finches has recently taken residence in a potted plant hanging above my front porch. Okay, maybe that’s not really a random fact about me, but I’m running out of ideas here. 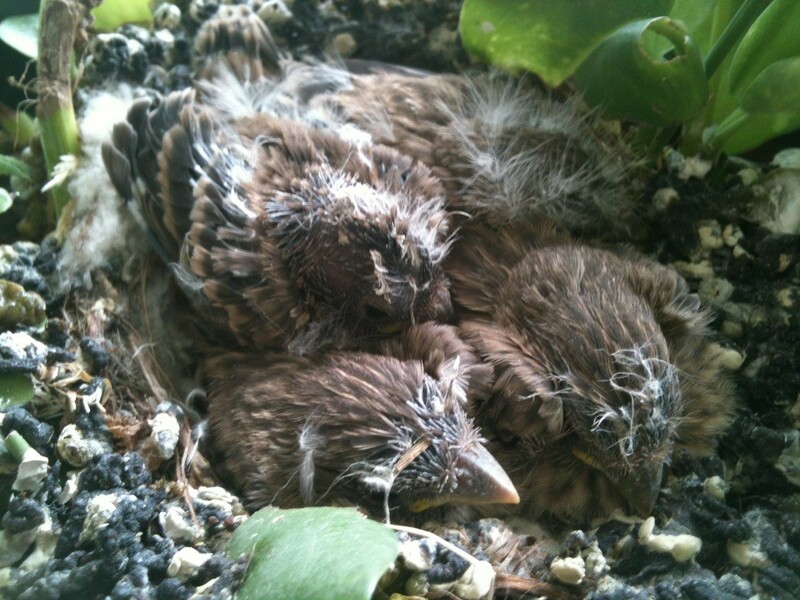 If you’ve been following me on Twitter, Facebook or Google Plus, you may have seen me post some pics and videos of a family of baby finches nestled in a little nest built within the confines of a potted plant hanging from my front porch. Here are a few photos of the little velociraptors. Click on the images to enlarge. 7. Umm… Oh yes, how could I forget? I was once a multi-millionaire for about a day. That’s right, I can honestly say that I have had the pleasure of having millions of dollars in my bank account. This is a true story! You see, my first job out of high school was as a customer account maintenance associate at a locally owned (and growing bank). My job was to verify all of the new certificates of deposit and personal loans and correct any mistakes entered by the customer service representatives. Well, as an employee of the bank I also had direct access to check my own account, which I regularly did to make sure checks had cleared, paychecks were deposited correctly, etc. Well, one day (I think it was a pay day) I checked my account and noticed I had nearly THREE MILLION DOLLARS in my personal checking account! Imagine my reaction when I saw that! After doing a bit of research, it turns out that when someone opened up a new special account for the bank they accidentally linked it with mine as a co-owner of the account. So, not only was a now a multi-millionaire, I was also a co-owner of one of the bank’s accounts. Obviously, I had to report the error to my supervisor, but I had fun with it. I asked her what I needed to do to withdraw a couple of million dollars from my account. She looked at me like I was crazy. I told her that I was a co-owner of one of the bank’s accounts, and I wanted to make a withdrawal. She still didn’t take me seriously, so I told her to check my account and see if I was joking. Her eyes grew very wide when she saw the balance on my account and that I was listed as a co-owner of one of the bank’s accounts. She thanked me and told me that she would take care of it immediately. I laughed, but she didn’t find it very funny. She never did have a good sense of humor. So, while my mulit-millionaire status was short-lived, I can honestly say that I was once a millionaire. Thanks for visiting! Grab a piece of cake before you leave! And be sure to comment below! Before you go, be sure to check out this trailer for my horror-mystery novel Devil’s Nightmare! Congrats! I always enjoying stopping by. I’m delighted to hear that, Erik. It’s always a pleasure to see you stop by for a visit. Congratulations, my dear friend! You deserve it. Wishing ALL your dreams come true! Thanks, MG! I’ll keep on pursuing them and never quit until I achieve success. Thanks for stopping by and commenting. Thanks, Nikki! You didn’t see the cake? I told everyone to save you a piece! Oh, well, I guess I’ll just have to bake another one just for you. How about one with pudding in the middle (Lucky 7 Meme post reference)? 🙂 Congrats on landing yourself a Versatile Blogger award too, Nikki! Regarding being a multi-millionaire, it was nice while it lasted! What fun. I saw your Tweet about your blog anniversary and had to come over to say congrats. Really enjoyed your post. 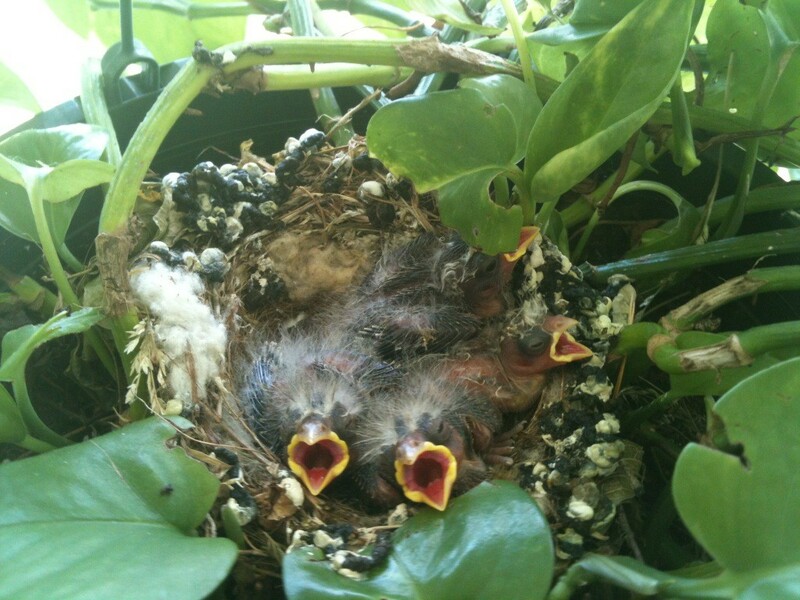 I once had birds nest in one of my hanging baskets, but the baby birds did not survive after the eggs hatched. Not sure why, but it did make me sad. Thanks for stopping by to celebrate my “Blogeversary” or is it “Blogaversary”? We’ll let Mirriam-Webster decide later. ANYway, I’m glad you enjoyed the post, Maryann! 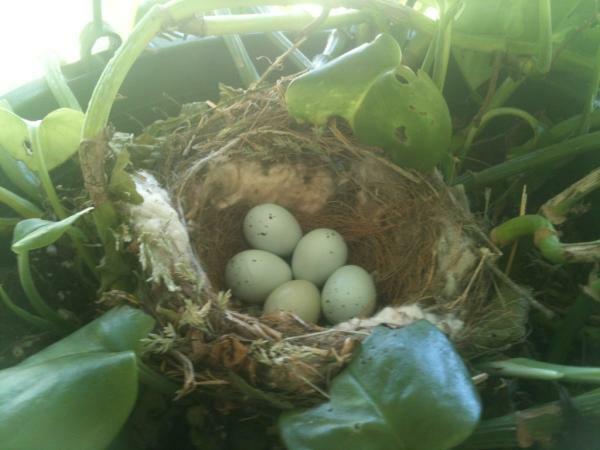 There were originally five eggs in the nest, but only four of the birds made it (I’m not sure what happened to the other one, because it just disappeared). I got to see one of the baby birds take its first flight which was kind of cool. The bird looked at me, tilted its head a few times, and then flew away. It’s was a nice experience. You are so interesting, Rob. And never been on a big jet– hard to believe. I was an aircraft mechanic– on the giant aircraft-. It was hard for me to believe that something that big could fly– but I love them. Great post and thanks for letting me know more about you. It’s always a pleasure seeing you visit my little corner in cyberspace, my friend. I too think it’s hard to believe some of these massive aircraft can stay airborne. When I saw a B-52 bomber fly overhead at a local airshow a couple of years ago, I couldn’t believe it could stay airborne while flying at such a slow rate of speed. That was probably one of the coolest experiences I’ve had seeing the B-52 flying overhead. I like your style! Don’t mind if I do. Isn’t it crazy how twitter works? I saw your post about feeding your dog, felt bad for forgetting to feed my own, figured how here’s a guy who likes pets so I’ll read more about him, and then I clicked from your twitter profile to your blog. And I get an award for doing so. How sweet is that? Not to mention I actually have an uncle whose real name is Sharkey that used to live in Texas, but he lives in Montana now. Cheers! I’ll be sure to let you know when I do my Versatile Blogger post! Got to love Twitter! 🙂 I’m glad you stopped by for a visit and I look forward to reading your Versatile Blogger post, Jeri! Hey that was perfect timing! Your anniversary and the award. You deserve it, now Can I get in on that million? 🙂 Great post once again! This is cool! You don’t seem like the snobby millionare type, so I would have never guessed I was in such lofty company! I’m supposed to nominate 15 other bloggers for this award, but I think I’d like to open this up to anyone who visits my anniversary post. 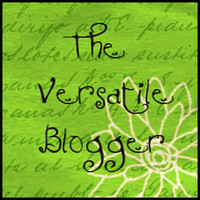 Claim the Versatile Blogger Award as your own, build your own post, have fun and let me know when you publish it.